Who could watch this video of people doing all kinds of crazy, fun, impossible upside down stuff without wanting to try it? Fortunately, we have a Muscle Beach veteran (the place they shot that video) right here in Yosemite Valley… and she’s teaching a class on March 11. Tom and I are both planning to go. I found out that Tom has been wanting to learn to do handstands since just about forever, and has great stories of getting his father to walk around on his hands so that the coins would all fall out of his pockets. After 13 years together, I’m still learning stuff about him. Huh. For my part, I think this is super cool – but definitely a few steps outside my comfort zone right now. Remember, I have a flat spot in my back that extends from L2 to S1, meaning that I tumble and roll a little like a 2×4. 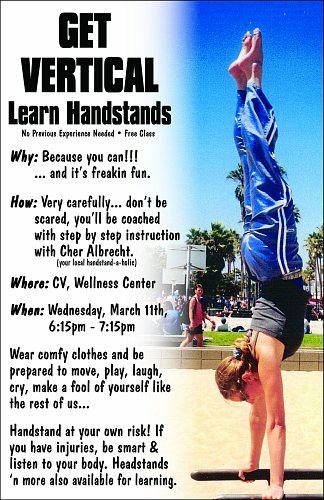 Do I have any business going to a handstand class? First, you never know until you try, and I’ll definitely take it slow to start. I’m getting used to my body again, making some small gains in flexibility, pushing a little, and finding out that I’m getting stronger. I’m taking on ski terrain where I fall, and it’s OK. I tried a gentle somersault on mats at the Wellness Center a few weeks ago, and while there is definitely a flat spot in my roll, my cautious experiment didn’t hurt. I tried a cartwheel in the playground in OH over Christmas, and that went just fine too. A friend told me of a woman he met who had her spine fused from C-something all the way down to S, who could lean over and put her hands flat on the ground. I bet she could do a handstand if she tried – and in any case, was not letting anyone tell her what she could and couldn’t do. Second, even if the handstand part is a bust for me, I’m betting that there will be a lot of laughter, general goofing, and I’m planning to bring a camera… Can’t wait!